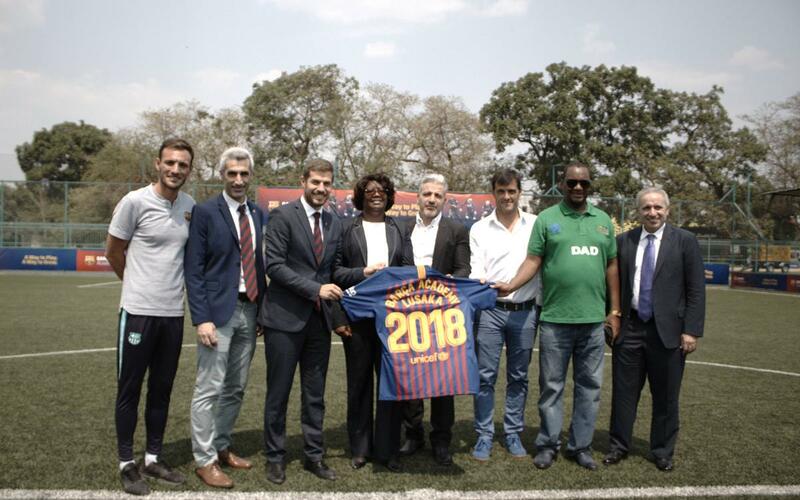 The Barça Academy Lusaka held its opening ceremony to welcome in the new sports season. The event was attended by the director of the Barça Academy project, Carles Martín, and the director of the International Project for Europe and Africa, Iñaki Andreu, who are both marvelled by the performance of the school, which already has almost 175 athletes after its first few months of existence. The opening of the Zambian school took place on the very premises of Barça Academy Lusaka, the Futsal Sport Complexland, considered the most modern and latest generation such facility in the country. Among other dignitaries, the event was attended by the mayor of Lusaka, Miles Stampa, and different representatives of the Zambian government including Sylvia B. Chalikosa, on behalf of the vice-presidency; Lombe Mbalashi, member of the executive committee of the Zambian Football Federation and Mohamad Ahmad, director of Futsal Sport Complexland. The director of Barça Academy, Carles Martín, commented that Barça Academy Lusaka “has become a large part of the international project as we are the first club to set up a school in a country where we feel very loved, and we would like to work hand in hand to be able to offer our experience and help with the development of football in Zambia”.